My indoctrination into the horror genre happened at a very early age. My mom likes to talk about me watching Poltergeist when I was around four or five years old; I kept jumping up and hiding behind the couch, but every time she asked if I wanted her to turn it off, if it was too scary for me, I adamantly said NO. In third grade, I made a best friend whose parents were just as loosey-goosey with her entertainment choices as mine were, and she opened up my entire world. By the end of my ninth year on this planet, I'd seen every Nightmare on Elm Street, Friday the 13th, and Halloween film that had been released and the It mini-series was my favorite movie EVER. None of those films ever scared me, no nightmares, no leaving the light on at bedtime; I thought I was untouchable. Then my friend introduced me to Sleepaway Camp, and that changed everything. I remember the exact day we put the tape in the VCR. It was a Friday after school in fifth grade, and I was having a sleepover with my best friend and another girl. We'd been talking about watching Sleepaway Camp forever, but we'd never been able to track it down and she had finally gotten her hands on a copy. We were so pumped, we didn't even wait until dark to start the movie. It didn't matter, really; we were made of steel, no horror film could touch us. That's what we thought, at least. While I was too young to truly grasp WHY that final scene of this film affected me the way that it did, it certainly got under my skin. Every time I shut my eyes, that image (any of you who have seen this movie know the image I speak of) appeared, like it was burned into my brain. I didn't give up horror films after this experience, in fact, I think I saw The Exorcist for the first time just a few weekends later, but it was the first time a horror film actually had the intended effect; I was horrified. 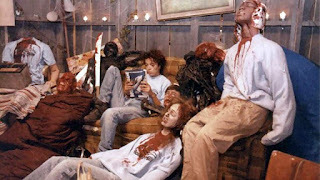 While I was an avid re-watcher of my favorite slashers, I never revisited Sleepaway Camp, or sought out any of its sequels, until I decided to write this review for The Movie Sleuth. The star of Sleepaway Camp is Angela (played by Felissa Rose), a young girl traumatized by a boating accident where she saw her father and brother get violently killed. She's now a ward of her Aunt Martha (an extremely bizarre character played with absolute conviction by Desiree Gould), who ships her off, along with her cousin Richard, to Camp Arawak for the summer. Shortly after arriving, bad things start happening, and then they just keep getting worse. The film is filled with terrible people, none of whom the audience is sad to see get gruesomely murdered. There are a multitude of interesting deaths, though, I must say, the one involving the curling iron is forever seared into my mind. The real horror of the film happens in the final seconds, leaving the viewer reeling and wondering exactly what the hell just happened. 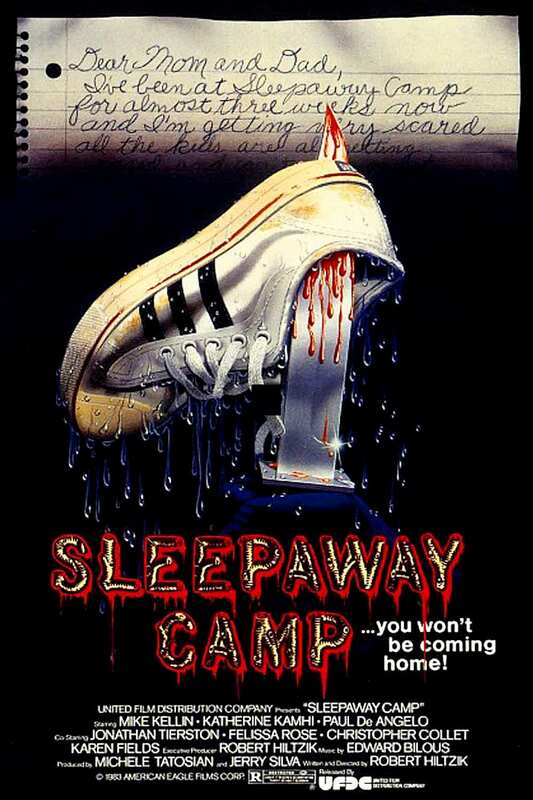 Without the twist, Sleepaway Camp is just another stab at Friday the 13th, but that's kind of like saying that without the twist in The Sixth Sense it's just another ghost movie. Upon re watch, there are subtle hints laid throughout the film indicating the terror to come, and honestly, Felissa Rose is perfect in her role, playing Angela in the exact right way to really drive the ending home. It's a dead man's party, Angela couldn't ask for more! 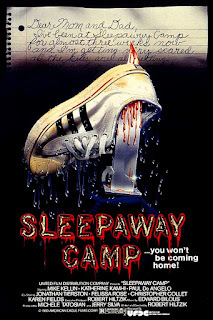 The tone of the second and third films in the series, Sleepaway Camp II: Unhappy Campers and Sleepaway Camp III: Teenage Wasteland, is decidedly different than the first. Apparently, the creative minds behind the sequels took the word "camp" from the title as an adjective, because these movies are just plain silliness. I mean, the second film actually features a death by latrine drowning (it's every bit as disgusting as you're imagining.) Watching the second film immediately following the first is jarring. While all three films definitely have that '80s horror movie cheese, the first one is extremely dark and provocative under all the men with mullets wearing short jorts. The same cannot be said for the follow-ups. Pamela Springsteen takes on the role of Angela in the sequels, and while she definitely has the right brand of crazy to match the films she's starring in, there is little of the depth to Angela that was present in the first film. Now, Angela is really just a crazy puritan who feels like it's her job to punish (read: eviscerate) any "bad" campers she encounters, and it works within the schtick of the films. The sequels aren't bad on their own, really, they're just goofy. Comparing them to the first film is when they really start to lose their edge. Have you even *seen* my hair? I'm CLEARLY bonkers! Seeing the original Sleepaway Camp for the first time in twenty plus years, I was honestly a bit surprised at how well it held up. Sure, it's an '80s cheese-fest, but the twist still hits hard, that image is still horrific, and the deeper story still manages to resonate emotionally, amidst all the silliness. The second and third films barely skim the surface of what the first film achieves, but that doesn't really mean they're bad. They're absolutely fun for what they are: an exercise in brutal deaths done cheekily. You could certainly do worse than revisiting these films for a fun, Halloween horror movie night.